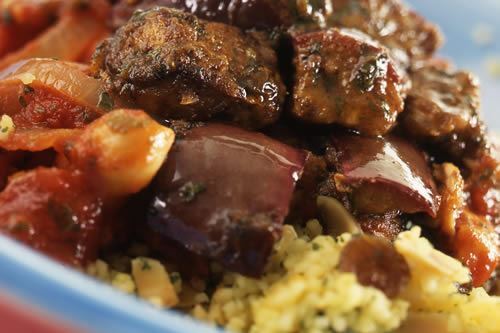 Place the couscous and stock into a large bowl. Allow to stand for 15 mins, stirring occasionally. Peel and chop the sweet potato into small pieces. Peel, de-seed and chop the squash into small pieces. Slice the courgette, carrot and red pepper. Place all the vegetables into on oven proof dish with a little olive oil, herbs and roast in a pre-heated oven at 200C / Gas 6 / moderately hot for 15 minutes. When the vegetables are cooked stir them into the couscous and add cashews (or pine kernels).